The features of any resort are always important to potential holidaymakers and this Sunshine Coast Riverfront accommodation is no different. The features here will leave you wanting more. The apartments ooze relaxation and tranquility, they will make you feel like your walking into your own holiday home. Make sure the family accommodation Maroochydore you book, is the right accommodation for your Sunshine Coast holiday. Behold the family holiday on the Sunshine Coast. Pack your bags and bring the whole family to Reflections Maroochydore resort and get ready for an unforgettable and beautiful holiday that you will be talking about for years to come. Our delightful fully self contained one, two or three bedroom apartments in this luxury Sunshine Coast accommodation are perfect for everyone. The apartments are spacious and comfortable with superb on site facilities. 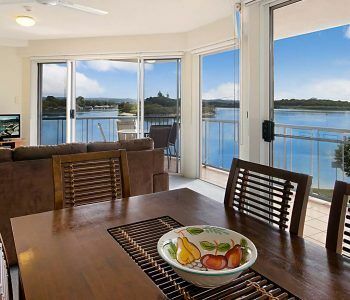 The whole family will enjoy the absolute Maroochydore River frontage, peaceful location and secluded sandy beach. You are close to all that the Sunshine Coast has to offer at Maroochydore. Why not head further afield and explore Mooloolaba with the shops and cafes along the Esplanade. Beyond the Esplanade lies the Mooloolaba Spit. Definitely an extended walk for the family that can be made fun with plenty of exploratory stops and diversions. There are plenty of trees lining the pathway, and cafes and convenience stores for refreshments along the way. Underwater World can also be found on the Spit with its exciting collection of live sharks, fish and stingray. Planned well, this could be quite a trip for the day with live encounters and shows to watch. Touch the baby stingrays that flap around their miniature reef habitat, catch the seal show — Seals Behaving Badly, and get up close and personal with the otters. If you don’t feel like cooking at all, after all you’re on holiday, you can stop in at any one of the local surf clubs for an easy family dinner at the bistro. Grab a takeaway to enjoy on your private balcony. Sit back and take in the stunning river views, listen to the birds and watch the sun set. We invite you to find out for yourself how good it can be at our family accommodation Maroochydore at Reflections holiday apartments. Book now. 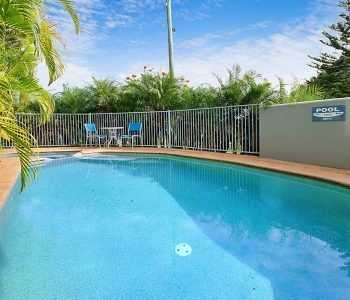 When you book this Maroochydore family accommodation you have the choice of a one, two or three bedroom apartments, they are fully self-contained with air conditioning, full cooking facilities and private north facing balconies. Whichever apartment you pick you know that it will be spacious and comfortable and will suit you perfectly. Why not choose to upgrade and enjoy the usage of your own private rooftop with a heated spa, barbeque and panoramic views of the Maroochy River and towards the Sunshine Coast hinterland. What more could you possibly need on this holiday? Luckily for you there is more, there is also a heated swimming pool and direct access to the river, you are just minutes from the beach and with a fast wireless Internet connection you have everything you could dream of for your faultless family getaway. This holiday can be anything you want it to be, take some time to find yourself and get back to your family. Cherish the time you have together here to laugh and bond, it is a rare occasion that families get to spend this much time together in such a beautiful part of the world. You can walk or cycle along the tracks that start right outside your hotel and you can even hire bikes from reception. You will find that your holiday here is all about convenience and relaxation. We want you to be happy and have a good time so you will keep coming back to enjoy more fun vacations. Book now and experience the holiday of a lifetime at this Maroochydore family accommodation. When you stay at this family holiday accommodation Sunshine Coast you are putting yourself in the perfect position to enjoy everything that the coast has to offer. However you are a little it secluded and set back from the hustle and bustle to give you the break you truly deserve. Every fun and exciting activity you could possibly think of is right at your fingertips. A little beach on the bank of the river is right outside your back door and makes for the perfect place to fish, swim and sunbathe. If you are really feeling adventurous on your Sunshine Coast holiday then all these things are available at Maroochydore, kayaking, diving, golf, whale-watching, deep-sea fishing and jet skiing. 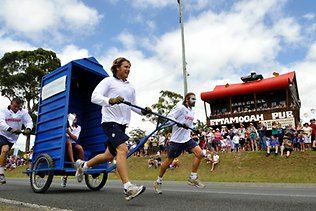 This proves what a great location Maroochydore actually is as you can just about do anything you can think of right here. It is in the heart of the Sunshine Coast and you will fall in love with your lives here. The other attractions that the coast has to offer include, Australia Zoo, Underwater World, Aussie World, the Eumundi Markets or Noosa National Park, which is where you will find the nudist beach. All of this and so much more can be reached from your family holiday accommodation Sunshine Coast. You can relax and enjoy the peace and quiet from your private balconies as you watch the sun go down every evening. Of you can head out for a bite to eat at any one of the fantastic restaurants and bars in the area. At this family holiday accommodation Sunshine Coast you can do as little or as much as you feel like doing. Each day you choose what you feel up too, the options are endless but this holiday is about your happiness, don’t forget that. Book this family holiday accommodation Sunshine Coast online or ring us today. 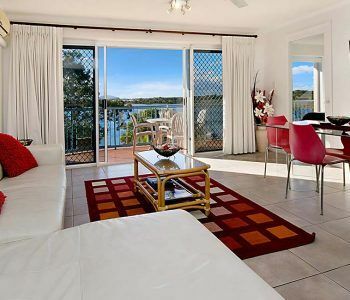 Are you looking for great value Maroochydore family accommodation? Reflections Holiday Apartments Maroochydore will make your family very happy. With all the mod cons — wi-fi, air conditioning, fully equipped kitchens, spa pools, swimming pool and washer and dryer — your holiday is set. All at very reasonable tariffs. The location is superb too. Right on the shores of the Maroochy River, there are plenty of spots to picnic at, or fish from. From the mouth of the Maroochy River at Maroochydore to all the way up to where the river branches into its various tributaries, there are countless opportunities for fun. With Cotton Tree just a five minute drive away, the park lands are a great place to entertain younger families and around the point Cotton Tree Beach is a popular spot for surfing, swimming, kite boarding, jet skiing and other water sport activities. Head down the coast for some more active surf at Alexandra Heads. In-between is the Maroochydore Surf Club where you will find a patrolled stretch of beach. This is an ideal beach for kids, and when you and the kids are done splashing in the ocean, you will find the surf club is great place to grab a cold drink and snacks. The whole coastal stretch all the way down to Mooloolaba is also well worth exploring, with Mooloolaba Beach offering a gentler swimming experience that is perfect for younger families. All the way down in Mooloolaba is the added attraction of the Sealife Sunshine Coast theme park (formerly Underwater World) where you can see thousands of underwater creatures, including sharks, saw fish, seals, turtles, stingrays and tropical fish. Experience all this by walking underwater through the glass viewing tunnel. Whether it’s the beach life, or a quiet break beside the river, you’ll find it at the Reflections Holiday Apartments. This is Maroochydore family accommodation where you and your family will have loads of fun, but it won’t break the bank. What are you waiting for, book now! 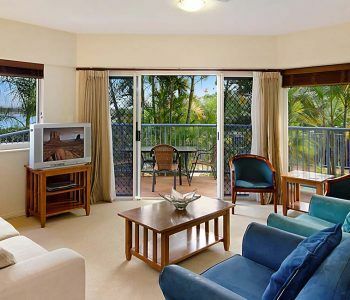 Our Maroochydore apartment accommodation, at Reflections is a great place to start your holiday on the Sunshine Coast. Come and discover the self contained accommodation in Maroochydore you’ve been missing out on. 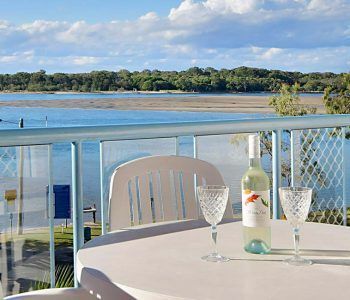 Reflections holiday apartments offers fully self contained one, two and three bedroom apartments with easy and comfortable accommodation in a location that is close to the Maroochy River and Mooloolaba’s favourite holiday spots. 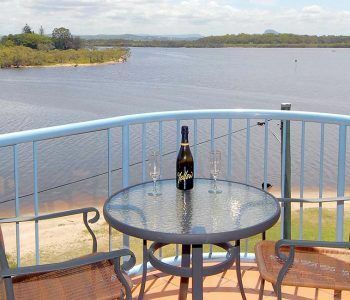 Our apartments offer one of the best locations on the Sunshine Coast for you to relax on your holiday…right on the Maroochy River. For walking, swimming, fishing or surfing, this is the ideal location for all these activities. The beaches surrounding Maroochydore offer something to suit everyone. Nearby Maroochydore beach is a popular spot, but you can also travel to Mooloolaba Beach for one of the safest swimming beaches on the Sunshine Coast. With it’s a north-facing aspect protected from the prevailing southerlies and sou-easterlies it’s also another popular choice for visitors and locals alike. Maroochy Beach is also a popular stretch, but on the other side of the Maroochy River on a spot called Pin Cushion is an area that is recommended for it’s surf. It’s not too crowded and performs well on all tides and especially a sou-east swell. Grommets (beginners) can learn at some of the best schools on the Sunshine Coast. Your kids can learn to surf with a professional, and also hang out with real surfers. With schools in Mooloolaba or Alexandra Headand there’s plenty of choice and variety of conditions with the former with gentler and more controlled conditions and Alexandra Heads offering a more exposed surf. All carefully supervised of course. Stay with the surf vibe and grab a bite at either the Mooloolaba or Maroochydore Surf Clubs. Mooloolaba Surf Club is a great place to go if the kids don’t need close supervision, they’ve just renovated and refurbished, and their kids area has wall to wall Playstation games and a chillout zone. 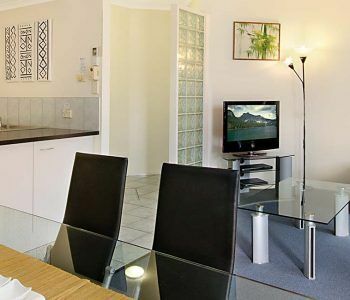 Our Maroochydore apartment accommodation, is a great place to start your holiday on the Sunshine Coast. It has everything you need for the perfect holiday close to the stunning beaches of the Sunshine Coast. Would you like Sunshine Coast holiday accommodation that is less ordinary? Book a place where you can enjoy everything that the Sunshine Coast has to offer, but also in a place that has privacy and seclusion from the hustle and bustle of the usual holiday hot spots. 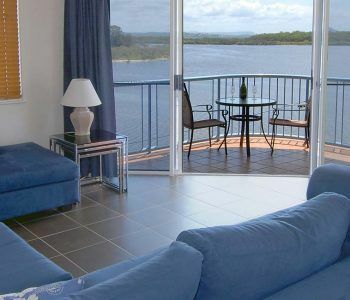 Reflections Holiday Apartments is located on the banks of the beautiful Maroochy River in Maroochydore. The views are superb, with tranquil vistas that overlook the river at the end of a quiet cul de sac. There is a little beach on the bank of the river is right outside the back door of this marvelous Sunshine Coast resort. It’s the perfect place to fish, swim and play with the kids. Of course you’ll also have your sights set on the bigger attractions of the Sunshine Coast — Australia Zoo, Underwater World, Aussie World, the Eumundi Markets or Noosa National Park. All of this is very accessible from your Sunshine Coast holiday accommodation. Best of all though, you will enjoy coming back to Reflections Holiday Apartments. Relax and enjoy the peace and quiet from your private balconies as you watch the sun go down every evening. Head out for a bite to eat at any one of the fantastic restaurants and bars in the area. For a real treat we recommend the Boat Shed Restaurant in cotton tree. It’s just minutes away by car and you’ll find it at the Maroochydore Rotary Park on the Esplanade. It’s got a very relaxed atmosphere and the menu is truly to die for. Just take a look here if you can’t resist a sneaky peek. Then again, the twin barbeques and outdoor dining facilities back at the Reflections Holiday Apartments is also very tempting. Any excuse to get you to Mooloolaba to pick up a big bag of juicy Mooloolaba prawns will be well rewarded. The kids will love you and. Dine poolside and then soak it up in the heated spa afterwards. Book your holiday at Sunshine Coast holiday accommodation that is less ordinary. The Reflections Holiday Apartments is where you want your next holiday to be. How about this holiday accommodation Maroochydore? For a holiday destination that is located on the shores of the Maroochy River, close to Maroocydore CBD and a stones throw from the surf patrolled beach of Maroochydore, then Reflections Holiday Apartments will do trick. 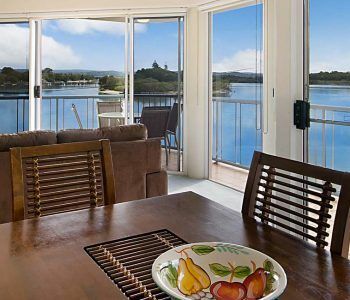 This holiday accommodation on the Sunshine Coast has a range of apartment options for singles, couples and families and is perfect whether you are in Maroochydore as a business traveller or holidaymaker. Unwind and relax in our one, two or three bedroom Sunshine Coast holiday apartments with the option to upgrade to an apartment with access to it’s own rooftop barbeques and spa pool. All apartments are roomy and well appointed, family members wanting their own space will find it here and with the usual amenities to make your stay comfortable with air conditioning, free Foxtel and wi-fi. The river views are spectacularly serene and the inner courtyard offers a splendid tropical setting. The sandy beach along the river at the back of Reflections Holiday Apartments is the perfect area to picnic, swim, sunbath or play with the kids. 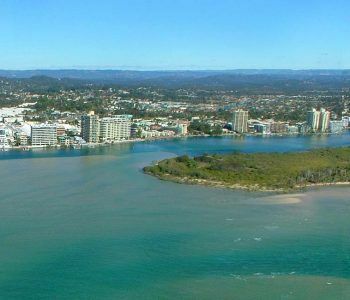 The Maroochydore township is also a very family friendly place to take the family, especially in Cotton Tree, this area is closer to the mouth of the Maroochy River, with Goat Island and Pincushion Island within view from the expansive park lands along the Esplanade. There you’ll find playgrounds galore, and Cotton Tree Beach is surf patrolled too. If you’re looking for a great restaurant in Maroochydore, The Boat Shed at Cotton Tree stands head and shoulders as a leader in the area. It’s relaxed and the simple rustic decor matches perfectly with their knockout menus. Our location in Maroochydore also means you are in easy striking distance of Noosa, the Eumundi Markets, Australia Zoo in Beerwah, and the quaint little villages dotting the hinterland. Closer to home there is Underwater World — a popular theme park that is… underwater with occupants to match. So how about booking this holiday accommodation Maroochydore? It could be your most perfect Sunshine Coast holiday yet. 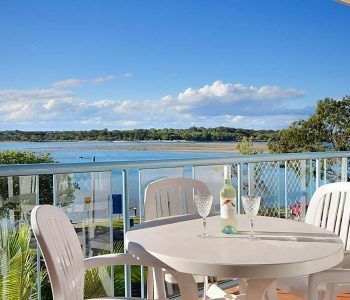 This Sunshine Coast accommodation, Reflections Holiday Apartments is centrally located on the banks of the beautiful Maroochy River in Maroochydore. For a location also close to the the main CBD and the Sunshine Plaza Shopping Centre then this is accommodation that will suit holidaymakers who like having options such as a local cinema and a choice of restaurants, pubs and boardwalk cafes. We have a complete range of waterfront accommodation options to suit every sized group of holidaymakers. Our fully self contained one, two and three bedroom apartments are all spacious and superbly appointed holiday accommodation. With Foxtel, free wi-fi and air conditioning your comfort is assured. The views are superb too, tranquil vistas overlooking the river at the end of a peaceful cul de sac. With the river such a feature of the Reflections Holiday Apartments charm, it’s easy for families with kids of all ages to to find recreational opportunities nearby. There’s space to swim and play on the sandy river beach and parks nearby. Bigger kids and couples can try their hand at more adventurous activities such as kayaking, jetskiing or standup paddle boarding. Our great location also puts you in a superb position on the Sunshine Coast. A few minutes drive takes you to the surf patrolled Maroochydore Beach. Divers can explore the man made reef at HMAS Brisbane. Maroochydore is also handy for whale watching and golfing on the Sunshine Coast. For the more adventuresome, Noosa is an easy roadtrip away. Take your time and explore the hinterlands along the way and get a real feel for the local produce, wineries and smallgoods producers. Mooloolaba isn’t far away either. Strap the kids in and catch a show at Underwater World and afterwards pop down to the local fish markets and pickup some of those world famous Mooloolaba prawns for the barbie when you get back. That leaves Australia Zoo in Beerwah which needs almost no introduction at all and is also not far away. Give your family plenty of time to take in what Sunshine Coast has to offer. There’s plenty to see and do. Then again, if you want a lovely relaxing time by the river then this Sunshine Coast accommodation, Reflections Holiday Apartments will do the trick. Either way, make sure you book now. Are you looking for the perfect holiday apartments Maroochydore? Reflections Holiday Apartments will do fine. Actually better than fine. 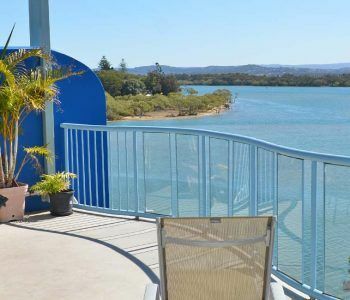 These holiday apartments on the Sunshine Coast has the accommodation for singles, couples and families and is perfect for the business traveller or holidaymaker in Maroochydore. 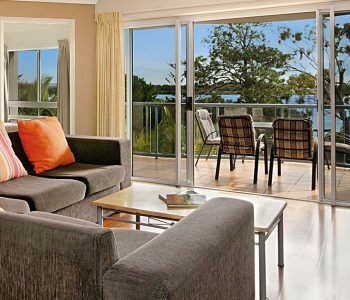 Our one, two or three bedroom Maroochydore accommodation are all roomy and well appointed. Family members wanting their own space to chill will find it in the apartment, on the balcony, beside the pool or on the private sandy river beach out the back of Reflections Holiday Apartments. There’s the usual amenities you’d expect to make your stay comfortable with air conditioning, free Foxtel and wi-fi. The river views are very calming and the inner courtyard offers a delightful tropical garden setting. The sandy beach along the river at the back of Reflections Holiday Apartments is the perfect retreat to picnic, swim, sunbath or play with the kids. 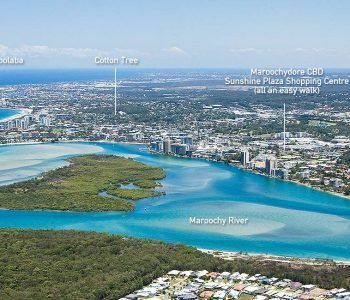 Maroochydore is nearby with the Sunshine Plaza Shopping Centre just a 15 minute walk away if having options such as a local cinema and a choice of restaurants, pubs and boardwalk cafes is important to you. If you’ve bought the family then Cotton Tree is also nearby with expansive park lands along the Esplanade. There you’ll find playgrounds galore, and the Cotton Tree Beach is surf patrolled too. Further along the coast is the Alexandra Headlands. If you have keen surfers in your family this is where they match wits with the elements as there are a few rocks to contend with. 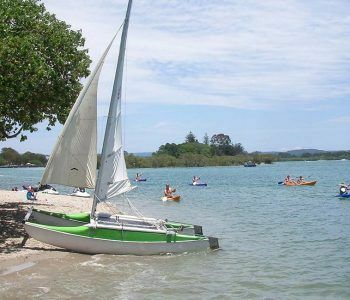 Cotton Tree is another option to surf too with several surf schools to choose from too if the kids are still learning. Dining in Maroochydore is simple, The Boat Shed at Cotton Tree is the crowd favourite. Their relaxed and the simple rustic decor matches their delicious menus to a tee. The golfing in Maroochydore is good too, so don’t forget your clubs. The Maroochy River Golf Club is the closest and offers a varied and interesting course with great views. Twin Waters and the Headlands are also good course too and welcome guest golfers. This could be the perfect holiday apartments Maroochydore. What are you waiting for, book now at the Reflections Holiday Apartments. Your family will love it here. 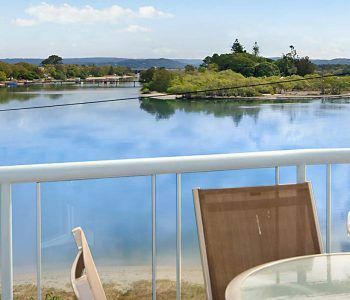 Our accommodation Maroochydore is the place to go if river views, private spa pool, BBQ and a reasonable price are at the top of your list. Reflections Holiday Apartments is the perfect Maroochydore accommodation destination for families and travellers who enjoy value for money. Our apartments are tidy and comfortable, and have a tariff to match. They are all fully self contained apartments with air conditioning in the living area. All other mod cons are included, fully equipped kitchens, washer and dryer, Austar and wi-fi. There’s lots to do on the water, Maroochydore is equipped with plenty of parks and walking paths as well. If you don’t like getting your feet wet, the parks at Cotton Tree and Picnic Point (just outside!) are excellent places for quality family time. The Maroochydore Beach Bowls Club, RSL and Maroochydore Surf Life Saving Club are also nearby spots to drop in on. Have a quiet drink with the locals, and join in with a friendly round of bowls. Drop a line in the river, with the outgoing tide you can usually hook a decent-sized Dusky Flathead and if you grab a spot on Chambers Island, you might even catch a Mangrove Jack. Dining in Maroochydore is an activity with more choice than expected. Tripadvisor has some excellent recommendations with over a hundred and twenty restaurants reviewed, and at the top of the leader board are several Cotton Tree establishments. For an authentic Maroochydore dining experience, The Boatshed Restaurant on The Esplanade, Cotton Tree is an ever popular choice and family friendly too. Back at Reflections Holiday Apartments, you will be able to enjoy your private rooftop spa pool, complete with gorgeous river views. With our location so handy to Mooloolaba, why not pick up some of the famous Mooloolaba prawns for the barbie. 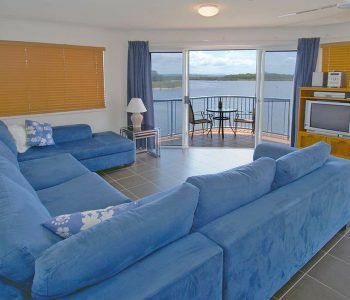 Our accommodation Maroochydore really is place to go if you have river views, private spa pool and BBQ on your hit list. Why not try The Reflections Holiday Apartments and see how far you can make your holiday dollars go. Book now. 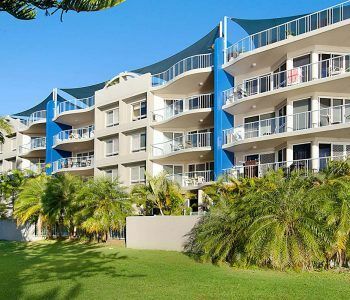 Maroochydore is a centrally located beach town in the heart of the Sunshine Coast and it is where you will find these Maroochydore holiday apartments. When you arrive you will instantly feel at peace and at home and that’s a rather special feeling to get from holiday accommodation. 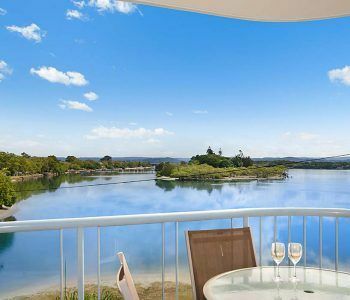 Located right on the banks of the Maroochy River, this whole holiday is perfect for those who love water. For while you stay here each day can be spent in the water. You can head to the beach to sunbathe or surf, or you can just jump in the river and swim, fish or kayak. At the reception of this Maroochydore holiday apartments you can hire bikes out and go for adventures in the surrounding area. 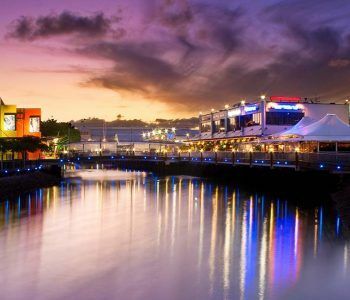 You could also take a romantic stroll along the beach or along the riverbanks in the evenings then grab a bite to eat at one of the many great restaurants near your resort. The cotton tree precinct is just a thirty-minute stroll or a short drive and has a swimming complex; it is also home to some great shops and restaurants. From your Maroochydore holiday apartments it is not hard to get to anywhere you need to be, you can drive up and explore the Sunshine Coast hinterland, or visit many of other attractions that line the coast, Australia Zoo or national park in Noosa are favourites with everyone. However there is so much you can do here we are sure there will be something to please everybody. 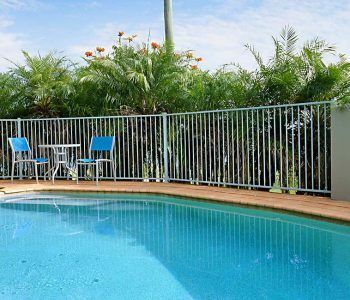 Book your relaxing vacation now and stay at this Maroochydore holiday apartments. 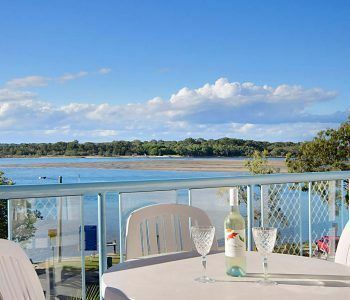 If you want holiday accommodation that is a little different than all the other hotels around this you have come to the right place, this Maroochy River accommodation is where you and your family need to be on your next Sunshine Coast holiday. The apartments are all beautifully designed and furnished with luxury features and amenities and a stunning balcony with an outdoor setting and breath taking vistas. We are sure that this is where you will spend most of your time on your holiday…by the river at this resort. 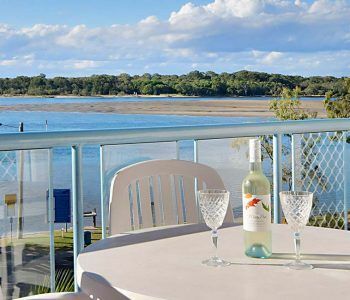 All the apartments at this Maroochy River accommodation are fully self-contained with TV’s, DVD players, Internet access, air conditioning, ceiling fans and fully equipped kitchens with laundry facilities. At the end of your long, busy days exploring you get to go home and put your feet up, unwind and have dinner together as a family on your private balcony enjoying the sun setting over the river. There isn’t anything as special as that, is there? There is a swimming pool and heated spa at this resort for all our guests to use and of course a barbeque area for those hot summer days where you all get together and enjoy a relaxed meal at the end of the day. However if you want a little bit of extra privacy then you can upgrade and get your own rooftop barbeque and heated spa. How wonderful does that sound? 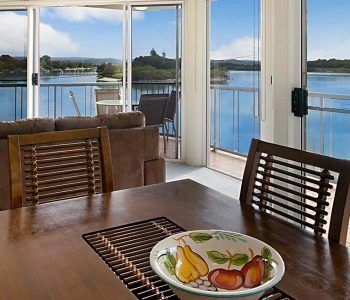 Call today and book this Maroochy River accommodation now. 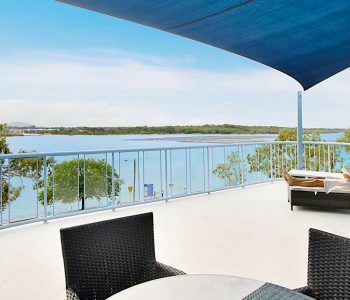 With no roads to cross you have absolute riverfront access from your Maroochydore waterfront accommodation, enjoy the tranquility and beautiful surroundings of this lovely part of the Sunshine Coast. There are so many activities you and your family can enjoy right at your fingertips, hire a range of water crafts, kayaks, paddle boards, surf boards, motor boats or fishing rods and enjoy your time spent exploring the waterways. You could also go for a bike ride or walk along the riverfront, listening to the birds and watching the sunset. 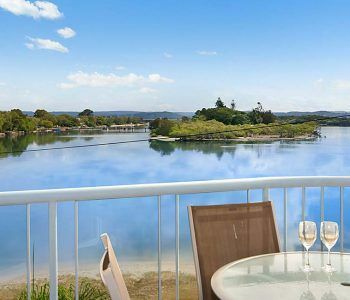 At these Maroochydore apartments you will find and love the perfect Maroochydore holiday. We are sure that you and your family will return many times in your life to just relax in the sun and play in the river. Being so close to the water we are sure you will want to spend a lot of your time here. Why not upgrade your apartment option to enjoy your own private rooftop with its own heated spa and bbq area. True bliss. Offering a great range of holiday apartment options there is room for all the family. Choose from a one, two or three bedroom apartments that are all fully self contained and were designed with you in mind, with stylish furniture and all the amenities the holiday maker needs. 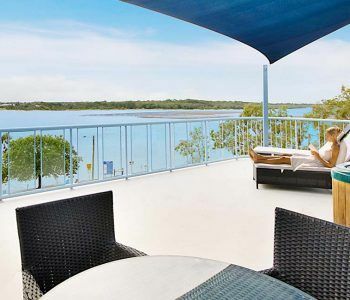 Book this Maroochydore waterfront accommodation and get ready for an unforgettable Maroochydore holiday.